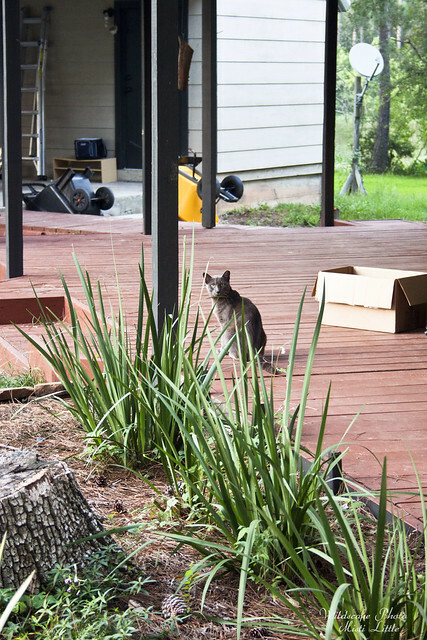 When we first looked at our house, Mother’s Day of this year, we saw a couple of cats running around. Two or three, no big deal. Maybe it would be fun to have a yard cat or two. Then once the ball got rolling with the process of purchasing the house I came for the inspection and sat outside on the porch because the owners had decided not to leave while the inspection was going on, choosing to move some things out at the time. 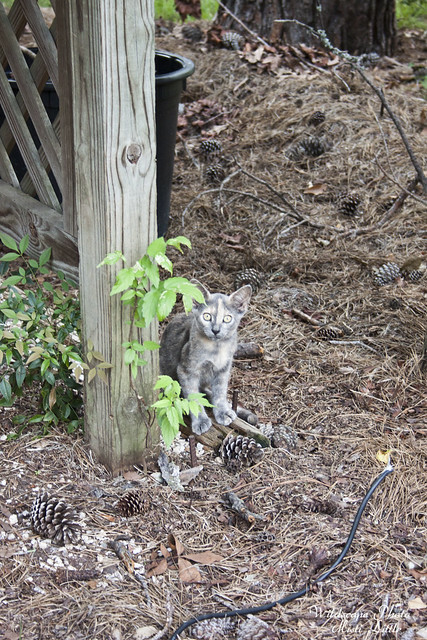 While on the porch I noticed a kitten and thought, well, ok, I get a kitten too. I saw a few of the adult cats but nothing else. Then we moved in. We saw just one kitten and a couple of adults again the day we moved in but it wasn’t until that night when we returned from making a trip to our other house that we saw just how many cats there were. There were kittens everywhere! At the height of the cat count I counted 15 cats. It was then we knew we were in deeper with our little cat colony than we thought. Our only experience with strays was that of our cat Leo. in 2004 we were living in the west Kendall area of Miami, almost as far west as you can go without hitting the Everglades, when one night we heard what we thought was a baby bird….all. night. long. At one point I went outside with a flashlight to look for a bird that might have fallen out of the strangler fig tree that was behind our apartment. I didn’t find anything. It was in the morning that Chris got up and found our cat Samson staring out the sliding glass door to a filthy little grey and white kitten on the other side of the glass. We managed to wrangle Leo back to the porch after he wanted to run away, giving him food and deciding that if he was still on our porch by the end of the day that we’d bring him in and make him ours. He was still there and eight years later he thinks he owns the roost most days. He went from a scrawny, mosquito bitten kitty to a long-legs-pink-nose-whacker. Initially I thought adopting out the kittens would be our best option—and we still would love to do that. I’m leery about placing ads in newspapers or on Craigslist for fear of the people who will adopt them. The adults, well, we figured that they would just have to stay around because we doubted that they could be adopted out having been feral their entire lives and if we turned them over to a shelter they would likely be put down. I put out my plea for help on Facebook and a college friend living in Austin responded with a link to a trap-neuter-return group out of Katy, Texas. I was familiar with TNR as my friends in Florida, Marc and Eliana, spend a lot of their time running the Meow Mobile in Miami. I’ve seen them in action, neutering a stray cat in Bolivia as well as one in their own neighborhood in Miami. It’s an interesting experience to watch. Within the first week of living at our new house I put the feelers out to the FCAP in Katy and got in touch with a volunteer who had me fill out a form regarding my needs and sent my request to their chain of volunteers with cages that I could borrow. I thought this would be an easier process but because I’m in the far-far reaches of Houston, not really in Houston at all but just a stone’s throw, it seemed most volunteers were not anywhere nearby. It took a few weeks of sending out emails again, following up before I was able to score three traps from a volunteer. I had to meet her at Spay Houston to pick them up, a centralized location for both of us and I decided to do some of my first TNRs at that clinic instead of driving all the way to Katy. The traps themselves are fairly easy to use and once I watched Debby, the volunteer, set the trap I followed suite and set the trap too. Simple! Back at home I put the traps on the north side of the carport so the cats could get used to them. They were oblivious to them; hiding, running and rubbing up against them. Finally on Tuesday night I decided to go for it, planning to take them the following morning. I stopped by the Dollar General on my way home from work and picked up three cans of sardines and three cans of tuna. Eliana and everyone else had said that the stinkier the food, the better. I withheld their evening meal from the entire colony before finally deciding in the dusky hours of the evening to go set the traps. The cats are so funny because they are used to us now and will get within a few feet of us, particularly at meal times. We honestly don’t want to feed them much when the kittens get larger and can hunt better on their own. I see the adults hunting all the time, bugs mostly. In my head I kept thinking, oh, you don’t know what’s coming for you kitties! Chris thought I was being too positive on the trapping, thinking it would come too easily. I wasn’t so pessimistic, knowing that hungry cats will probably go after anything they can get their hands on. I set the first trap under the carport, lining the cage with newspaper and opening the can of sardines on the end of one side, the side that doesn’t set off the trigger. Then I put a second cage along a strange, little deck we have on the side of the carport. This was the popular cage with all of the kittens sniffing around on the outside. Finally, out in the open of the grassy part of the driveway I put another trap. I stood by on the porch waiting and watching when the light orange kitten decided to snoop out the third cage in the grass. It didn’t take but a few seconds and in he went, the trap door shutting. The kitty didn’t even jump, continuing to eat his booty of food. Score! I went inside to let them keep investigating and when I came back out my favorite cat, a sweet little calico (there are two calicos) had found itself inside the second cage. Again, it wasn’t distracted and instead was enjoying its meal. Pleased with the process, I was very happy to see this working faster than I expected. One of the adults, a big grey male was heavily snooping the cages and made a beeline for the third and final cage. A bit of timidity and then in he went. I was afraid he would outwit me and escape with a sardine but no, the trap door closed and I had my third and final cat for the night. I grabbed the towels I had to cover the cages and went to approach the trapped cats. Initially oblivious to what had happened to them, my appearance shocked them into reality as they bounced around the cage. Quickly I covered them and shuttled them all to Chris’ man-cave, our converted garage. I’d cooled the air down and prepared and area for them to hang out. They were all spooked so I let them be for awhile, coming to check on them a few times before I went to bed for the night. Sleep was not heavy that night. I tossed and turned, worrying about the cats, wondering if they were ok, wondering about arriving at the clinic the next morning, and in turn my own cats had started feeling poorly and I was having to deal with two sick cats on top of all of this. I went in to check on the cats the next morning and I’d put the two kittens a little bit close together. The light orange cat had pulled in the towel of the calico a bit, weaving the towel through the wires of the cage. This caused the room to be visible and all I heard when I entered was a slightly hysterical cat. Overnight my other worry was transporting the cats. I’d initially decided to put them in the back of my truck, covering them to transport them. I didn’t have room inside my truck for all three cages. I did a little research and saw some negative things about transporting cats in the back of trucks so I decided against it. In the mean time I had thought I could configure the inside differently, putting up the arm rest in the middle and stacking at least two of the cages, possibly putting a third next to them. The third one wasn’t going to work out as it would prevent me from changing gears on my stick shift. I thought for a few minutes as I was loading the truck what my options were and I sadly decided to let one of the cats out, knowing that possibly I wouldn’t catch it again in the future. Because I loved the calico so much I decided to let it out. If Chris would let me have another inside cat, the calico would be it. Though, some of the other kittens are warming their way into my heart now. Out the calico went, not happy with me, and off I went down the highway to the clinic. During the drive I would peek into the cage and see how the cats were doing. The kitten was most active, meowing and whining, but the adult male was practically catatonic—staring straight ahead and shaking. I felt incredibly bad for these guys, especially the adult, because I knew they’d never had this much interaction with humans, much less a car! I arrived about twenty minutes after what I’d want to arrive at, and found the place much busier than I expected. People with their own pets, dogs and cats mostly, were there for low cost wellness visits and surgeries. It was pretty crazy. Though I’d been told I could show up with three or less cats without an appointment I was worried that I’d be turned away because I didn’t have an appointment. But, it worked out. I signed in the cats and paid for their visit and then turned around and drove back home to check on my cats before heading into work. The one frustrating thing about the clinic was that their hours on their website for Wednesdays say pickups for ferals are between 3:30 and 6pm. I had been planning to arrive closer to 6 so I wouldn’t have to leave work so early but they’d initially told me 3:30 was the only time I could pick them up. Exasperated I told them their website didn’t say that and then they ‘remembered’ it was Wednesday and I could pick them up no later than 5:30. So, I had to leave work early anyway—and then when I arrived the cats weren’t even ready! Two other ladies were there waiting on their own ferals, the place dead otherwise. The crowd of that morning had vanished. One of the ladies said that it was unusual for them to be so behind, but I was thankful because otherwise ‘my’ cats would have been waiting around. The tech/secretary at the front desk gave me the cats’ paperwork, some general information and vitals plus the information on what was done to them, and then finally I had the cats back. Traffic was horrendous going the other way, out of town—of course, everyone goes into Houston in the morning and then escapes at night—but we finally made it home. Unfortunately that wasn’t the end of things for the cats. They had to stay in the cage for at least 24 more hours to make sure they were eating and they had no side effects from the surgery. Back to the man cave they went! The sardine cans from the night before were still around so I mixed up some of the dry food I normally feed the colony with a little water and opened one end of each cage slight to shove the food in. The cats weren’t all that interested in being near me, so they huddled up on the other end anyway. I replaced some of their newspapers with fresh paper and let them chill out for awhile. When I went back a little while later the food was devoured so I refilled it again. The kitten was a little spastic and enjoyed dumping the water everywhere so I had to replace papers a few times. As the cats were awake and acting fairly normal, I wasn’t keen on leaving them cooped up in a cage for a full 24 hours. I consulted with Eliana who thought 12 hours was more than enough if the cats were acting normal and no side effects were occurring. So, a little over 12 hours after their surgery, the following morning I took the cages outside to the driveway, opened them and shooed them out. The kitten meowed his way out, running to his brothers and sisters and stayed nearby. The grey cat dashed out and around the storage building, before I saw him running across the backyard to the fence on the south side. He did not want anything to do with me! I thought it so funny that the kitten wasn’t more afraid of me than he was, but he gathered with his siblings and followed me to where I keep the dry food for them and joined in the morning feast. When I returned home this evening the grey cat had returned, though he eyed me suspiciously. I’m glad he is ok and has returned so that I know he is doing alright. Anyway, I didn’t mean for this post to be so drawn out, but it has been a stressful week dealing with the outdoor herd of cats and then my two sick kitties inside. Shoving pills down cat’s throats is no fun. The sweet kitten that was fixed. Look, you know you want him! If you look closely you can see his left ear has been tipped, helping to signify to others later on that he has been neutered. This one is growing on me too—he camouflages well. I guess it could be a female, I’m not sure. I’m thinking the tortoiseshell momma was his momma. The adult grey cat giving me a stare down. He was pretty calm in his cage, I expected more chaos from him. I’m sure I will have more thoughts as I slowly go through the stray herd. If you have any questions I can try to answer them, or if you are local to Houston and want a kitten, let me know. Wow! I was looking at that red one and the calico’s. But I am afraid they would not like being indoor cats after being born in the wild. I thought about an outdoor cat too, but I am afraid it would get run over here. I need a squirrel chaser. wow. so much work. i admire your fortitude. Thank you, thank you for doing this. It’s SO important. There are a lot of studies showing that ferals don’t do as much to the wildlife population as assumed- if you feed them, you’ll notice they will hunt a LOT less. It’s a good thing we’re NOT in the area- I’m such a sucker for lanky overgrown “teenage” (not tiny but not full grown) cats. Also for giant boy cats. 15 cats! 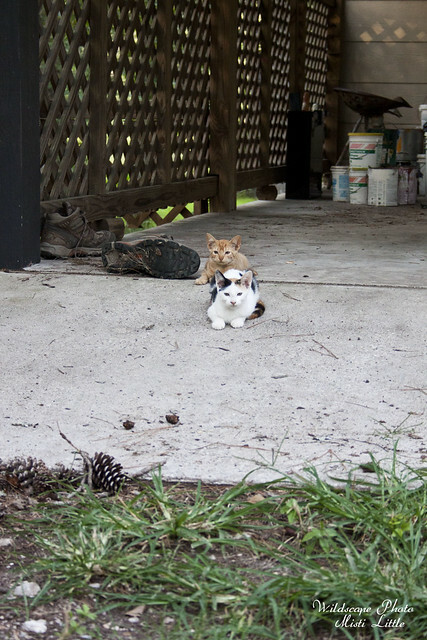 We have a cat give birth under our porch, and we had four kittens to deal with. We eventually brought the kittens to the local animal shelter. They were really pretty colors, so we were told they would be adopted easily. They were also okay with hand holding because we had been holding them since they were two weeks old. The mother we neutered, and she lives on our front porch. She’s tiny, and she does hunt, but she helps keep the mole population down in the garden. Once they are neutered, they don’t travel far. We’ve had a small problem in that another cat (the father we think), creeps around to look for food. Less is better however, the food can get costly. The kittens will most likely be adopted if you give then to the shelter, so don’t worry to much. I must admit I am a cat lover too and its hard to resist helping them out when they need it. Recently I had a stray female neutered and then ended up adopting one of her kittens but watching him as he changes from an animal we couldn’t even touch into a great friendly cat full of personality makes it all worth the effort. I agree with Chel too feeding stray animals can make a huge difference to the native wildlife population. Hi M.! I do not know if you remember me, but we met at some swaps from Gardenweb in South Florida. I still have the cotton plants you guys gave me. I check your website from time to time and I am always amazed at how much you do outdoors. Lately, I have not touched my plants because our family discovered cats. My kids wanted a pet but we never got one. My husband suggested feeding a cat who we used to see around. (Big mistake!!!) Soon we had 4 or 5 cats coming to our house every day. Then the first cat had 4 cute little kittens in our yard and we took them in. I then decided I needed to trap the rest of the cats and have them spayed and neutered. Then another pregnant mom started coming and she had 3 other kittens before I could catch her. We now have a mom (former feral) and 4 big kittens in our pool area. Three smaller kittens in one bathroom and we feed 4 other outdoor cats. We also take care of 3 other cats in an office building accross 441. I cannot believe how much our lives have changed since we discovered these wonderful creatures in early May. I enjoyed reading your account of TNR since I had to learn how to do it too. I am now the proud owner of a trap and I have spayed or neutered 7 of the cats and I am still working on the rest. Bless you for what you are doing. my husband and I also are rescuers and do tnr. we had a GREATabundance of cats in our yard…really wooded around us and people would dump them on the little road behind us. we had dozens of cats that we started with and we returned between 50-75 back to the wild encouraging news for you is that after this 7-8 year period we have conquered the problem. we now only feed about nine of the original old cats. yes, they set up a colony back in the woods. we’ve seen a lot of cats come and go and always hope someone took them in. we have 5 in the house all raised by hand and they think I’m their mama. there is no cat better than one raised by the hand of a loving human so anyone who adopted one of our babies got a great cat. good luck to you and stay vigilant. i know it’s expensive but doing that was our contribution to society. i also fostered cats and kittens from one of our local rescue groups. that was a sobering experience. at one time i had two mamas and 15 babies. they were adorable…one mama was even a russian blue which i had to guess was a lost cat. one of our cats was from a litter that was thrown from a car on the interstate….go figure. Currently working with someone to TNR a small group, and this is my first experience! Yours sounds exactly like ours, so nice to read about someone else’s firt experiences too and know that we are doing it properly, it also provides a nice sense of community (that we are all TNRing together for the same purpose, just in different locations!) Good luck with the rest of your colony! 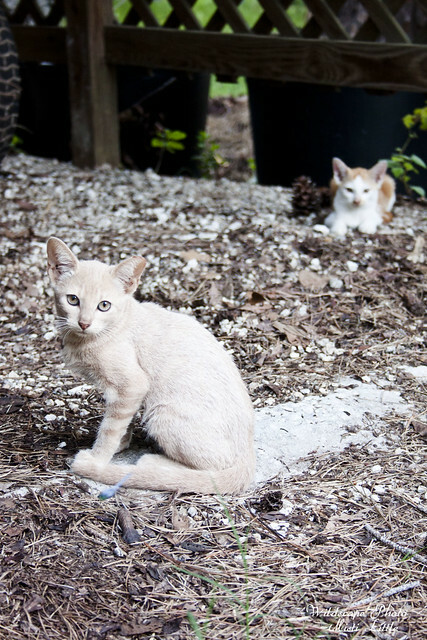 You are lucky they are on your own property – ours are not and we now have an angry and defensive “caretaker” to contend with, who is pro spay neuter and anti release!! !